A water-based lube infused with menthol to heighten sensitivity. 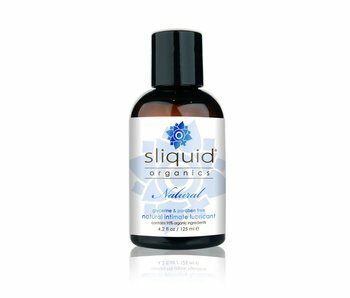 Sliquid Organics Sensation is a water-based stimulating organic personal lubricant botanically infused with natural ingredients. It is designed to heighten sensitivity and provide a deep, pleasurable, stimulating sensation during use. Blended with peppermint oil and food grade menthol, this organic lubricant goes on cool, and warms pleasurably with friction. Sensation was designed for those looking to add extra stimulation to an already pleasurable experience. 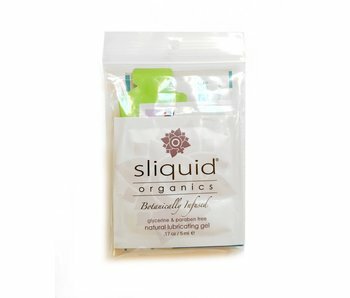 This glycerin and paraben free organic lubricant has been blended with certified organic botanical extracts that heal and support the body. Aloe Vera and Alfalfa are natural skin soothers. Vitamin E is well known for its healing properties, and Green Tea and Hibiscus are well documented for their invigorating and skin elasticity properties. Flax is an organic source of Omega-3 fatty acids, and Sunflower Seed is rich source of amino acids and minerals. Clitoral gel made with naturally derived stimulating ingredients. This all-natural oil creates a warm and unique tingling sensation. An oil-based arousal balm made from all natural ingredients. A natural water-based lubricant with organic botanical extracts. This balm offers a warming effect, then a tingling sensation. Give 'em a spin and see which lubricants you like!